Is it a restaurant, a desert café or a bar? The answer is the combination of all 3! It is Seoul’s first cereal café, where you can enjoy al-kee-hol along with a bowl of cereal (because, why not?). 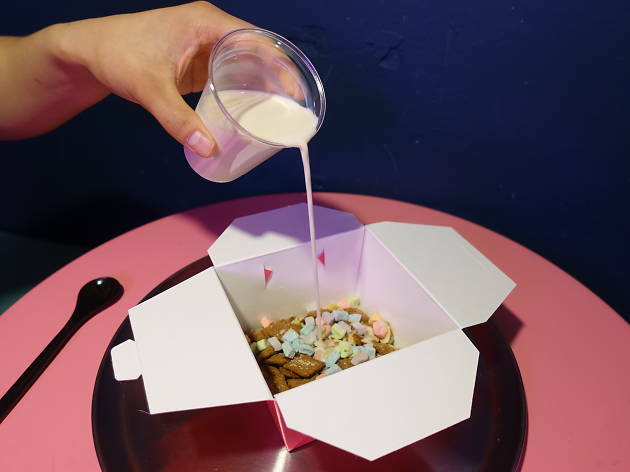 Created by 4 artists (actor/K-pop singer Yoon Kye-sang, photographer Kim Rin-yong and Hong Sung-hyeon, and stylist Lee Jin-kyu), Midnight in Seoul is a place for cereals from 8am to 12pm, while from 6pm to 2am it turns into a bar. 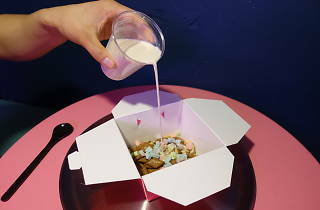 Its photogenic interior completed with baby-pink walls and cutesy stacks of cereal boxes will likely to have you pull out your smartphone for some Instagram shots as soon as you enter the space. With a cereal menu updated on a weekly basis, over 40 different cereals are available, many of which are directly imported from overseas. And yes, it's quite a scene, especially on your first visit here, to witness all of the cereal eaters nurturing their bowl way past the breakfast hours. To order, you write which one of the cereals you want on a piece of paper they provide, choose between milk, yogurt or ice cream and finally select one topping (M&M's, nuts, gummy bears, marshmallow, fruits, etc.). While you can often see a number of sold-out kinds, don't be discouraged and just let the server of know what you want — they will help you get a nice bowl that you've probably never seen in Seoul. As for the price (3,500 won - 6,500 won), it seems a bit high for cereals served in a paper bowl. But slurping a bowl of Lucky Charms whilst being surrounded by pastel walls and Korean celebrities who occasionally drop by for their cereal fix, it's obviously selling in the south side of Seoul.